Last week, we began placing the first of 30 crossbeams, after first having put in place a support structure consisting of a total of 92 columns. Once all the crossbeams have been installed, we will start putting in the 346 girders, which have lots of cables sticking out (see the arrow in the photo). After we finish putting in the girders, we will pull these cables tight to create a sound base for the layer of concrete that’s to be poured on next, followed by a final layer of asphalt. 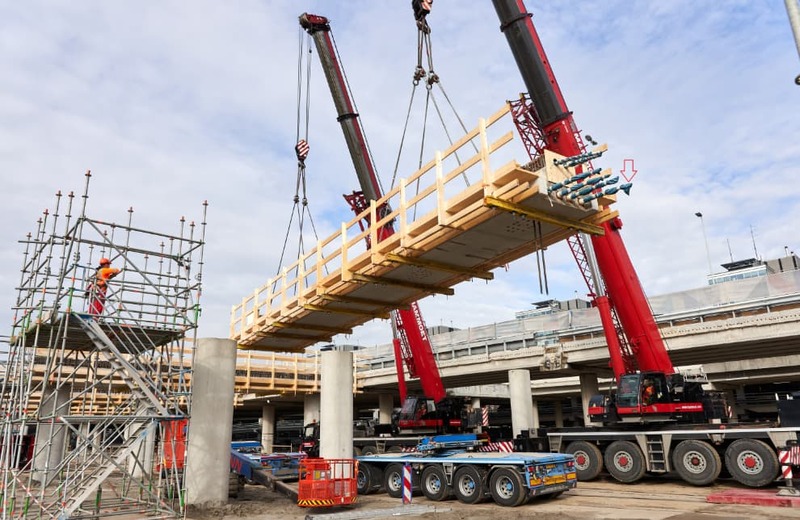 The purpose of this project is to broaden the Ceintuurbaan Zuid viaduct in order to ensure optimal accessibility to Schiphol in general, and to the new terminal in particular. The aesthetic challenge of this project is to seamlessly connect the newly added surface, which will run exactly 493 metres and 59 centimetres, to the existing road. The widening of the viaduct is part of the Landside roads and utilities project. During the work, all roads and buildings will remain accessible. Because renovations or not, Schiphol never stops.